The adapter for converting a magazine-fed firearm to use linked ammunition allows the user of a firearm to quickly and easily change from a standard magazine to belt-fed ammunition and back without permanent modification to the firearm itself. The adapter is simple to apply, attaching to the weapon with a minimum of connections and locking into the magazine well of a firearm. The ammunition belt passes through the adapter by way of an intake system which moves the belt horizontally through the device. As a result an unbelted round is delivered to the firing chamber each time a round is fired. The construction of the unit enables the belt to stay free from contact with the weapon while rounds are fed into it as well as ensuring that the spent links are expelled away from the workings of both the weapon and device. Q. Aren't the belt links incompatible with the firing chamber of a firearm? Does this pose an issue in regard to the function of the belt-feed adapter with its host weapon? A. 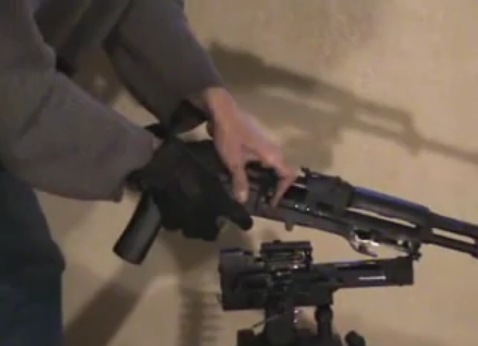 No, the adapter device transfers an un-belted round directly into the firing chamber of the firearm. All functions related to the transfer of ammunition from belt to weapon are facilitated by the adapter itself before the round is transferred to the firearm. Q. Does the belt-feed adapter require its own internal or external power source to function? A. No. The adapter is powered by the energy generated from the firing of a round by way of its connection to the the weapon. Q. 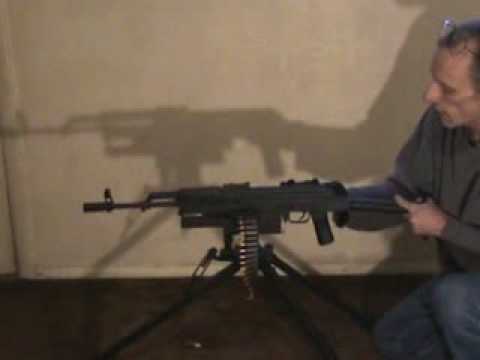 Does application of this device require permanently modifying the function of the weapon or dedicate it to single use as a belt-fed weapon only? A. No, the adapter is able to connect and disconnect from the weapon through a minimum of attach points. It could also be manufactured to be a permanent modification if it were desired however. Q. Is the adapter reliant on or integrated into a tripod or bi-pod? A. No, the adapter is a self-contained unit though you could utilize a tripod or bi-pod in conjunction with it. Q. Is overheating an issue while using the adapter with a firearm? A. Overheating will depend on the frequency which the weapon is being used and not on the adapter itself. If the weapon is firing in short bursts, or if single shots are being taken it will heat up more slowly than if being fired in full automatic mode for sustained periods of time. Either way, the adapter will supply belted ammunition for the shooter as long as is needed. Q. Is the weight of the adapter a significant factor to consider in relation to the accuracy and use of the weapon it is paired with? A. Weight increase to the firearm is minimal and can be decreased further by the inclusion of lightweight materials during the manufacturing process. Q. Is the belt-feed adapter limited to use with only one make or model of firearm? A. No, the adapter could be manufactured to function with any magazine-fed firearm. The only consideration would be accounting for the dimensions unique to each weapon. A number of designs are currently under development. Q. Is the weapon used with the adapter required to be fully automatic? A. No, both semi or full automatic firing modes would function with this device. Q. What entities can utilize this technology most effectively? A. Any organization which identifies a need for belted ammunition and requires the ability to adapt quickly in response to changes in tactics and environment. This adapter is a patented technology which enables the user of a firearm to quickly change from a magazine to belt fed ammunition and back on demand, providing greater adaptability in its deployment. The advantage this technology offers is that it allows a magazine fed firearm to be utilized for sustained fire with little preparation time. This allows the user to rapidly adjust to changing conditions on demand, providing greater adaptability and utility for the use of the firearm. This method is unique in its approach as previous attempts at adaption have relied on feeding ammunition from the side of the weapon directly into the firing chamber. Doing this necessitates a static use or permanent modification to the firearm which limits it's versatility. The basic function of the belt-feed adapter is the same regardless of which firearm it is applied to. The only necessary consideration during the manufacturing of these devices would be accounting for the the dimensions unique to each model of firearm in question. 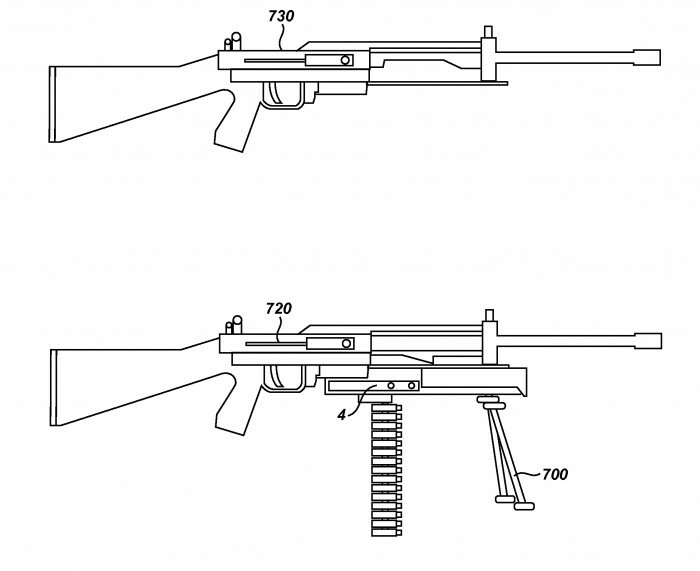 This would also allow the manufacturer to offer a suite of solutions for a variety of firearms. 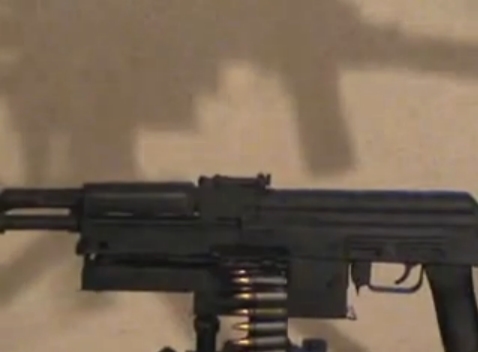 In addition to any potential civilian use this item could find immediate application by military or security forces operating in the field, enabling them to adapt their tactics more fluidly to cope with changing circumstances and allow them to maximize the use of the small arms they have equipped. We are interested in the sale or license of this technology and are open to a variety of arrangements. A conceptual prototype has been developed and we are willing to provide technical assistance or information which may be needed for review or implementation. 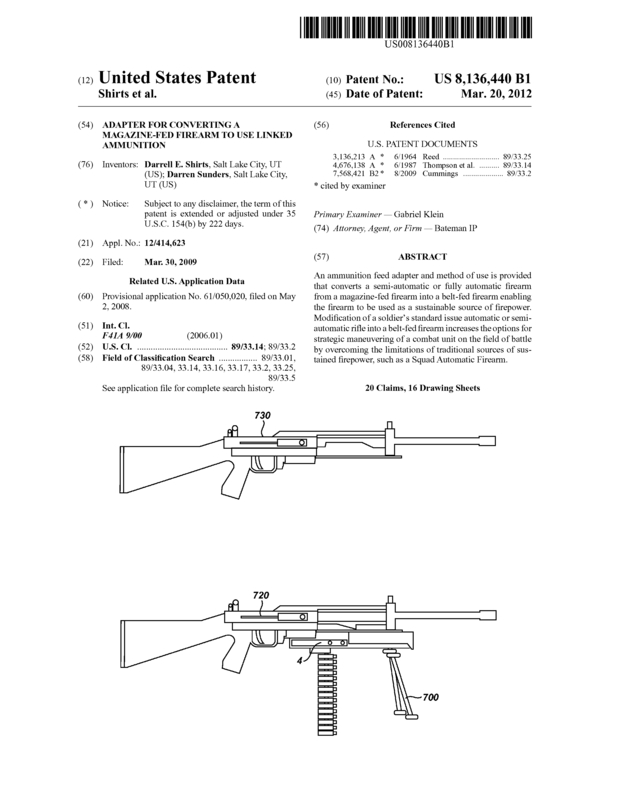 Page created at 2019-04-26 17:46:35, Patent Auction Time.